I read this article and found it very interesting, thought it might be something for you. The article is called CheapTickets launches Urban Traveler microsite and is located at https://www.cheaptickets.com/blog/2008/02/cheaptickets-launches-urban-traveler-microsite/. popular urban destinations and event of the month. EbonyJet.com’s Senior Editor Terry Glover. We are pleased to partner with CheapTickets.com’s new Urban Traveler site to highlight some of those destinations and available travel options. Of our EbonyJet.com top picks (check back often, because we’re constantly peeping new hot spots!) 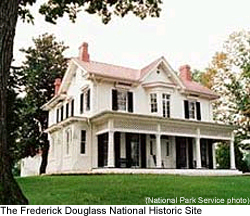 my top choice of historic destinations would have to be the Frederick Douglass house in Washington, D.C. Besides his legacy as a great orator and abolitionist, the fact that Douglass staked out a homestead in an area designated as "off limits" speaks to the challenges we’ve been able to overcome and the striver in all of us that turns every obstacle into an opportunity. The fact that he did it smack in the middle of our nation’s seat of government sweetens the pie! Check out the Urban Traveler microsite at http://urbantravel.cheaptickets.com.